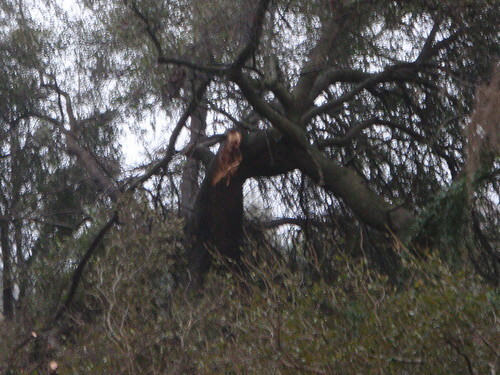 The twister broke that tree and flung it down the road. 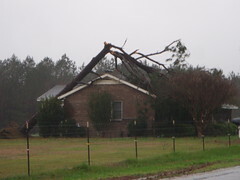 Tornado damage, Lowndes County, Georgia, 3 March 2012. Let's hope the county doesn't decide to cut the whole tree down now. It's still a fine old oak tree. By old, I mean old-timers a couple of decades ago recalled it as one of two (the other is on the other side of the road from it) that had been there back when that side of Quarterman Road continued south to the river, and along it to Cat Creek Road, which hasn't been the case for probably 70 years or more. The good news: rain! We got rain! We like rain! This is awsome...thanks for sharing! "A preliminary assessment by Lowndes County Fire-Rescue shows 15 homes severely damaged and uninhabitable, another 10 with moderate damage and five with minor damage, she said. "The tornado caused light damage to Louis Smith Memorial Hospital in Lakeland and the nearby Lakeland Villa Convalescent Center, according to a press release from South Georgia Medical Center, which owns and operates the Lakeland hospital." Glad you're safe, John. How are those canopy roads? Apparently you did not venture out very far at all. In the Walker's Crossing area there are homes heavily damaged. That tree on the house photo is NOTHING! Indeed, we went home, and then it got dark. See first comment above about further damage farther out.